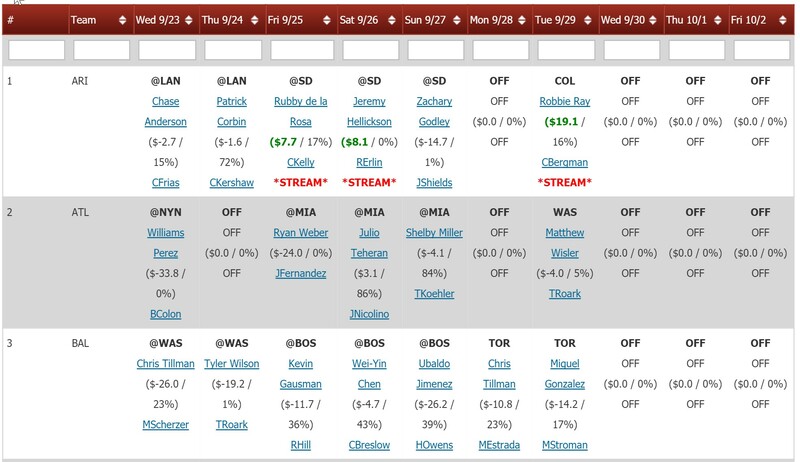 Streamonator is the ultimate tool for streaming fantasy baseball pitchers – aka identifying starting pitchers worth picking up on the waiver wire for a specific start or two. It also helps fantasy baseball owners determine when to start/sit a pitcher on your roster. Do I need to be good at math to use it? How many games do you project/value? All MLB starts for today + the next 6 scheduled days. Projections for next week (Mon-Sun) are available beginning on Fridays. Wins, Quality Starts, Losses, Innings Pitched, Earned Runs, Hits, Walks, Strikeouts, Home Runs, ERA, WHIP. Wins, ERA, WHIP, K’s, and IP are then used to determine the value of each start in 5×5 12-team MLB fantasy baseball auction dollars (IP are used for valuing ERA/WHIP – a 7 IP start with a 1.00 WHIP is more valuable than a 5 IP start with a 1.00 WHIP. Conversely, a 1.50 WHIP in a 7 IP start does more damage than a 5 IP start with a 1.50 WHIP). 12-team mixed league fantasy baseball auction dollars. This is calculated by multiplying each start by 30 (to reflect a full year’s worth of starts) and then run through our Player Rater. We feel auction dollars work well because they can be directly compared to pre-season $ values (for 12-team ESPN leagues) and our in-season and rest-of-season player raters. Why do you rank starts based on fantasy baseball auction dollars? Just ranking pitchers in order of best to worst is unhelpful when comparing pitchers across multiple games. It is possible for the 5th best start on one day to be less attractive than the 10th best start on another day. In addition, the 3rd start could be WAY better than the 4th start while the 4th and 5th starts are about the same. So there is a definite need for a metric that scales based on the quality of the start. Game Time. It is set at Eastern Standard Time – e.g., 1 = 1PM EST. Any game times prior to 1PM are made negative (e.g., -12 for noon) for easier sorting. How do I sort by stat? Click the column name to sort in descending order (most to least). Click a second time to sort in ascending order. What are the text boxes under the column header for? These are for filtering reports. Report filters allow you to limit the rows to only those that meet your criteria. How do you project these stats? The projections start with Steamer Rest of Season projections that are updated daily. This is used for setting each player’s park-neutral baseline for ERA, K-rate, BB-rate, HR-rate, HBP-rate, and BABIP. These stats are then adjusted by Razzball based on the following factors: 1) Projected opposing team lineup’s ability vs the pitcher’s handedness (i.e., RHP vs LHP), 2) Park factors, and 3) Whether the start is home vs away (pitcher’s perform better at home than road). For today’s projection, the results are updated several times a day to take advantage of posted lineups. Weather conditions are also incorporated into today’s projections. The ratios are multiplied into projected IP based on a pitcher’s recent starts with adjustments made based on several gameday factors and projected baserunners (e.g., the better the WHIP, the more IP). Win, Loss, and Quality Start percentages are based on formulas leveraging the ERA projections (including the opposing pitcher’s ERA for Wins/Losses). What is a good $ value for streaming a pitcher? This will vary depending on the number of teams in your fantasy baseball league, bench sizes, and how active your leaguemates are on the waiver wire. Here are the dollar value targets for standard default formats (ESPN/Yahoo/CBSSports/NFBC). Once you use the tool for a couple weeks, it will be pretty easy to identify a dollar value that you can sustainably find a couple times a week. Here are my suggested targets for various league formats. Note that H2H leagues tend to use more starts so you will need to take the target down a couple dollars. How do I identify pitchers available in my league? The ‘%OWN’ is based on our ultra-competitive 12-team MLB Razzball Commenter League ownership rates. 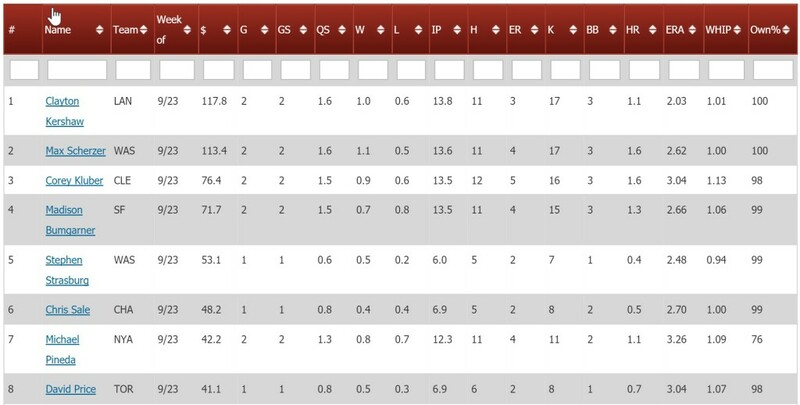 Filtering this column to include only pitchers owned in less than 80% of leagues (<80) is typically a good way to get rid of owned pitchers. How accurate are Streamonator projections? This is a great question and the most difficult one to answer. Our goal is to provide the most honest, transparent projections on the Internet. We appointed a dedicated robot (the Ombotsman) to provide daily updates on our accuracy. Here are the results for every day of 2015 and every day from May to September 2014. There is a link on that page that provides instructions on how to read the results on that page. There is a lot of noise when looking at accuracy at the daily level because there is huge volatility in day-by-day performance. Some days, aces dominate and meatball flingers get crushed. Other days, the opposite happens. But, over time, it is fair to hypothesize that this volatility averages out and it should be straightforward to demonstrate accuracy. Here is the easiest way we have figured out how to demonstrate our accuracy. Below is a distribution that includes every projected start from 2015. The average projected $ value (Stream-o-Nator AVG$) projected for each bucket matches nearly perfectly with the actual average (Actual AVG$). The Actual STDDEV$ column underscores the crazy volatility found in starting pitching performances. The standard deviations for each range are between $69-$87 which means that 68% of the time, a pitcher’s start value will be about +/- $75 from the projection. How often do you update/upgrade the methodology behind Streamonator? We are constantly looking for ways to improve the projections. The extent we update/upgrade the methodology will vary based on 1) our access to additional data sets (e.g., weather), 2) free time to research and test any additions/changes and 3) inspiration. 2015 marked a huge year in terms of overhauling/upgrading the methodology and one of the key reasons why the accuracy (as measured by the Ombotsman) improved throughout 2015. In 2016, we overhauled the hitter/pitcher matchup code to best leverage Steamer hitter and pitcher data based on handedness splits (e.g., if it is an LHP vs a RH batter, the matchup code uses the LHP’s projected performance vs RH bats and the RH batter’s proejcted performance vs LH pitchers.). In 2017, we made some smaller improvements to improve pitcher IP projections. How do Streamonator projections compare to other projection sources? Honestly, hard to say. We do not have access to other subscription services. Googling uncovers the occasional study that seems pretty favorable. We are confident enough (based on a significant amount of testing) that we put out an accuracy challenge to anyone who does Daily Fantasy Sports projections in mid-July 2015 (no takers to date). The one comparison we have done because 1) the data is free and 2) they are much bigger than us so we do not feel bad about calling them out is against ESPN’s Fantasy Forecaster. We compared Streamonator $ values vs ESPN Fantasy Forecaster Game Scores for 1,332 starts between May 1 through June 29, 2014 and Streamonator correlated much better to both the actual $ value (as estimated by us) and to the Actual Game Score. How do I choose between a 1 start and 2 start pitcher? The below chart equates the average $ value of a 2-start pitcher’s two starts to a one-start pitcher’s start for weekly leagues. So if a 2-start pitcher averages $4 in value across his two starts, that is the equivalent of a single start that is worth $7. This is based on standard 5×5. Can I customize the $ values to meet my league settings? Not at this time. It is something we continue to explore. Can I customize the $ values based on how I weight each category (e.g., I value K’s more than Win percentage because it is more reliable)? Today’s projections always at razzball.com/streamers. i have made deposits of 25 on Wednesday and today so I can get on this site for fantasy information can I get conformation to get the stats and use of Razz ball? How do I purchase just Streamonator if I’m not interested in any of the packages. Hi Rudy, does this still work for “or”? OR	|	David Price|Justin Verlander in ‘Name’	This would display the stats only for David Price and Justin Verlander. I Copy/Pasted the exact example you used and didn’t get any results. which pitcher does the RED STREAM word signify to stream, the top or bottom pitcher?